There are many interesting aspects to the recent departure by Vice-President Tareq al-Hashemi from Erbil in the Kurdistan Regional Government (KRG) area of Iraq to Doha, the capital of Qatar. Among those aspects is one that has yet to receive the attention it deserves: The means of travel used by Hashemi – who is sought by the central government in an alleged criminal case – from Erbil to Doha. 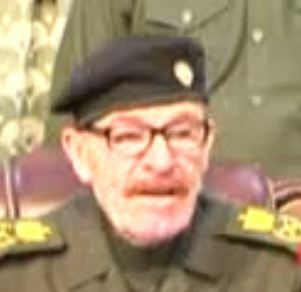 Most accounts simply state that Hashemi arrived in Doha on 1 April en route from Erbil. 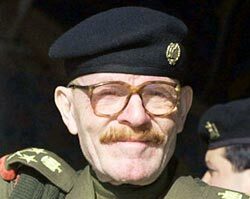 Some Kurdish interior ministry officials even went on record saying they had no knowledge about Hashemi’s departure. 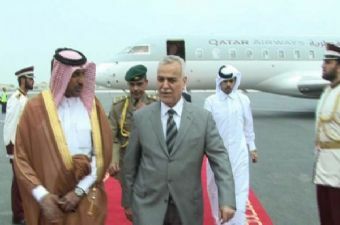 The picture of Hashemi arriving in Doha, published by the website of the vice-president, is clear enough. It shows Hashemi stepping out of a Qatar Airways jet, apparently onto a red carpet and with ministers waiting to welcome him. So, Hashemi arrived with Qatar Airways. It is true that they have announced plans for an Erbil–Doha service. But that service will not commence until May. Also, it will be operated by Airbus 320s. The aircraft on the picture looks slimmer than an Airbus, perhaps more like a Bombardier? 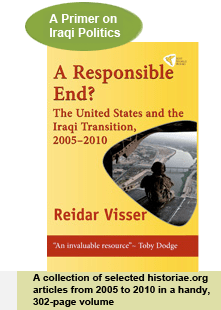 The question of Iraqi airspace sovereignty has received some attention lately, both with dramatic declarations that Iraq would “close its skies” for the Arab League summit, and in relation to reports that Iran is continuing to send weapons and fighters to Syria on flights crossing Iraqi territory. What this picture seems to indicate is that a foreign country, Qatar, can in fact send its aircraft in and out of Iraq with impunity, even on missions perceived as hostile by the Iraqi prime minister, Nuri al-Maliki. Whether the jet actually flew straight down to Gulf (as is most likely) or headed via Turkey and Jordan to avoid “central government” territory is somewhat academic. Guarding Iraq’s borders is a central government prerogative anyway and it seems entirely unrealistic that the Qatari jet landed in Erbil without the express permission of the Kurds. On top of persistent conflicts related to Kurdistan in the oil sector and the judicial extradition battle for Hashemi, the latest Qatar Airways episode once more raises questions about the true nature of the so-called Iraqi federation. It is becoming increasingly unclear whether the country is anything more than a very loose confederation.